If you are all set to attend an interview related to J2EE/Java Web application development then, it is recommended to brush up this important concept.I witnessed this question in telephonic round interview. Today I am documenting it for future reference and for others. 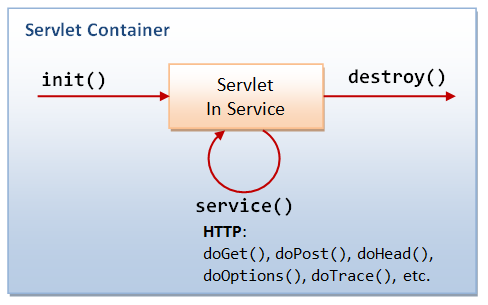 What is Servlet ? : A Servlet is a Java program that runs within a servlet container. Servlets receive and respond to requests from Web clients. Servlets could in principle communicate over any client–server protocol, but they are most often used with the HTTP protocol. Thus "servlet" is often used as shorthand for "HTTP servlet". As every object is having a life-cycle so as of servlet instance. 1. On demand basis - On arrival of first HTTP request for the given servlet . Note : load-on-startup can specify an (optional) integer value. If the value is greater than 0, it indicates an order for servlets to be loaded, servlets with higher numbers get loaded after servlets with lower numbers. Please note, init(ServletConfig) is being called by the servlet container to indicate a servlet that the servlet is being placed into service.We can override this init() method see this for reference. Here is a visual explanation of Instantiation phase, in layman terminology. 2. Service phase : In this stage for every new request a new thread is created or allocated from a pool to invoke that servlet instance which was created in earlier stage . The HttpRequest and HttpResponse objects will be new for each new request. One commonly asked question in interview : How HTTP request coming from web client is served by servlet ? HttpServlet(javax.servlet.http.HttpServle) class reads the HTTP request(coming from client), and determines if the request is an HTTP GET, POST, PUT, DELETE, HEAD etc. and calls one the corresponding method. It is important to note that each request is served by a new thread if and only if our servlet is not implementing SingleThreadModel interface. It is not recommended to use SingleThreadModel interface. Is servlet threadsafe ? Answer is : No, but we can make by it thread-safe by following some standard so that it can serve multiple request in thread safe manner. How we can make servlet thread safe? 3. Destroy phase : When a servlet is unloaded by the servlet container, its destroy() method is called. It is executed only once in servlet life cycle. A servlet is unloaded by the container if the container shuts down, or if the container reloads the whole web application at run-time.